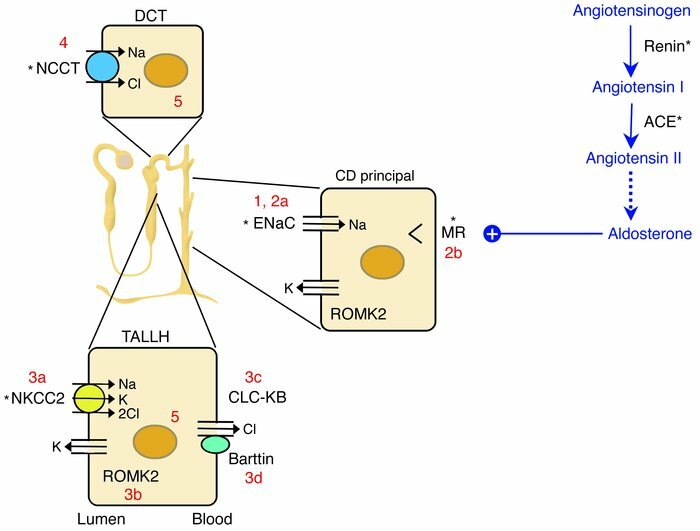 The renin-angiotensin-aldosterone axis and molecular pathways of sodium reabsorption in the nephron. A cartoon of a nephron is shown, with sodium-reabsorbing cells of the thick ascending limb of the loop of Henle (TALLH), distal convoluted tubule (DCT), and collecting duct (CD). The latter is responsible for fine regulation via the aldosterone-activated mineralocorticoid receptor (MR). In all cells, sodium exits the basolateral compartment via the Na/K-ATPase (not shown). Aldosterone synthesis is controlled by angiotensin II. Numbers reflect cellular components affected in disorders of sodium homeostasis referred to in the text: 1, Liddle syndrome; 2a/b, recessive/dominant PHA1; 3a/b/c/d, types I/II/III/IV Bartter syndrome; 4, Gitelman syndrome; 5, Gordon syndrome. *Sites of action of antihypertensive drugs. ROMK2, renal outer medullary potassium channel.